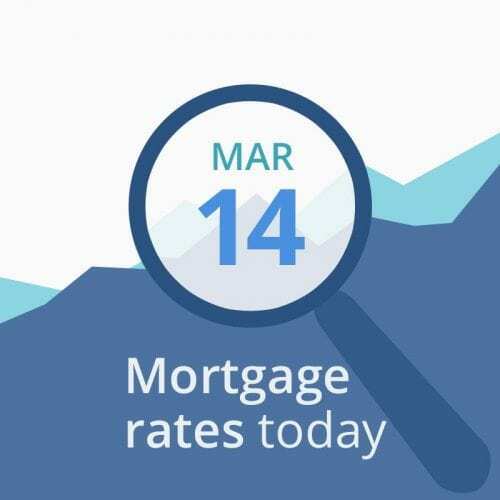 Average mortgage rates were very slightly down again yesterday. You have to go back nearly 15 months to find lower ones. News from London again caused some late movement. In a vote, the UK parliament at least theoretically made the most damaging form of Brexit (Britain quitting the European Union, or EU) less likely. But it soon emerged that the country remains hopelessly mired in this mess. The data below the rate table are indicative of mortgage rates rising a little or holding steady in the short-term. But we’ve been here before, on each of the last three mornings. Indicators start off negative only to turn positive later. And there are more votes in London this afternoon. Normally, these indicators provide a good idea of what to expect for the rest of the day. But that hasn’t been the case so far this week. As expected, the British parliament yesterday voted to take the most damaging form of Brexit off the table. But any euphoria was short-lived. The UK, which has the world’s fifth biggest economy, has to resolve this continuing mess by March 29 or request an extension from the EU. But, after more than two years, parliament seems as far from agreeing what it wants as ever. If it finally gets its act together, American mortgage rates might rise. If it fails, and does the nation’s and the other economies real harm, they might remain low. Meanwhile, markets are increasingly focused on current U.S.-China trade talks. Yesterday, President Trump told reporters regarding his timetable for the negotiations, “I’m not in a rush whatsoever.” And his original Mar. 1 deadline for an agreement passed nearly two weeks ago. But both sides badly need a good outcome, and for similar reasons: to shore up political support at home and to step back from economic slowdowns. But markets worry those pressures will prevent a win-win conclusion — and might even result in no deal being reached or a lose-lose one. Once the talks end, markets will digest the outcome in detail. If no deal is concluded, or if the one that ‘s agreed turns out to be worse than neutral for the U.S., expect mortgage rates to tumble. But, if it’s a win-win — or even just not too terrible and simply brings uncertainty to an end — they could rise. And finally, the Federal Open Market Committee meets next week (Mar. 19-20). That’s the Federal Reserve body that determines many interest rates. Understandably, investors and analysts will be reading the final day’s statement and watching the press conference closely. Expect market reactions if they find anything unexpected. Yesterday, Comerica Bank removed from its forecasts the only Fed rate hike it was expecting this year. By comparison with last week, there are fewer economic reports in coming days. Indeed, there is none today that’s likely to move markets. Investors and analysts will certainly pay attention to tomorrow’s industrial production and capital utilization data, both of which are measures of the strength of American industry. But those are no longer top-tier indicators and expectations are already low. However, any of these reports could move markets sharply if they contain information that’s wildly different from forecasts.